The 94th edition of the National High School Baseball Championship, one of the most highly anticipated high school sporting events in Japan, opened at Hanshin Koshien stadium on August 8. 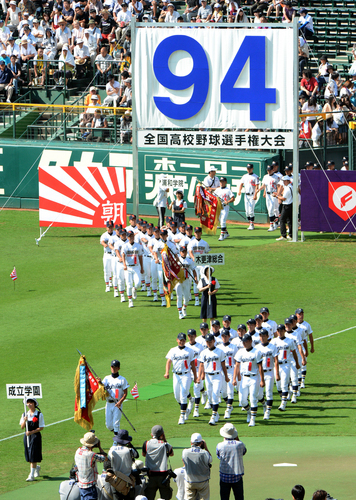 Over the course of the tournament's 15 days, the 49 teams that won their regional championships (including five teams making their Koshien debuts) will give every game their best, chasing the national crown. Looking to give encouragement to the areas worst hit by last year's earthquake and tsunami, the role of leading the players into the stadium as well as the ceremonial first pitch for the opening game of the tournament were assigned to players from Iwate, Miyagi and Fukushima prefectures. The crowd responded with a wave of applause. At the opening ceremony, Takahiro Shimotsuma, team captain of Sakata Minami High School in Yamagata Prefecture, also touched on disaster recovery in his oath of fair play.